Designed and prototyped by Ted Yost with a couple of tweaks and manufacturing by Harrison Design, the HD-807 frame fixture gives you an easy to use "third hand" that comes in so handy while doing a variety of custom mods to the M1911 frame. Fixtures to hold 1911 frames have been around for years, but Ted's design is unique in the fact that it doesn't require any tools to mount it to a frame and put into use. No more digging through a tangled mess of hex keys to find the right one, no wearing out set screws or stripping threaded holes like you eventually have with other designs. This fixture will fit even with the mag catch in place, so you can sand the frame flat and catch flat at the same time. You can leave the ejector mounted and the HD-807 will clear it. 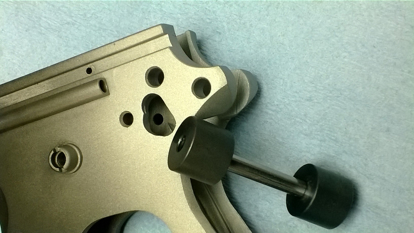 Just slide the fixture in rod first from the bottom of the mag well. When you see it emerge from the top, bump the top of the rod against your workbench or vise and the fixture locks in place in your frame. Clamp the rod in your vise at any angle to give you the best presentation of the surface you are working on. When you are finished, bump the top of the rectangular section at the top and the fixture releases your frame. In stock and ready for shipping, order yours from shop.HarrisonCustom.com. $99.95 + postage.